Melitopol Institute of Ecology and Social Technologies of the Open International University of Human Development "Ukraine"
An approach for phytoindication assessment of the ecological factors based on diapasonal scales taking into account the cardinal points values and possible asymmetry of the plant species response was proposed. Ecological factors are modeled by phytoindicator scales with restricted range. In the central part of the factor range the species response curve has a shape that can be reliably approximated by the Gauss normal distribution. This allows completely grounded via cardinal points that are directly designated by diapasonal indicator values, calculate ecological optimum of the species. Average of species in community ecological optima scores weighted in accordance with their projective cover gives phytoindication estimation of an ecological factor. Species distribution asymmetry increases when approaching the marginal positions within gradient. This phenomenon is observed in the study of real gradients. These phenomena are also a result of the mathematical properties of ecological scales. To simulate the response of species distribution curves alternatively symmetric Gaussian model the β-function was used. This function can simulate both symmetric and asymmetric distributions. Since phytoindication performs the inverse problem in comparison with the modeling of the response curves, it is appropriate to β-function is also be used to solve phytoindication problems. Use of β-function is possible to estimate the species optimum zone based on its fundamental points with the probable distribution asymmetry of the response curve. Also, the simulation of distribution curve makes it possible to narrow the range of possible values of environmental factors, in terms of which species can exhibit the observed abundance in the community. Accordingly, this increases the informational value of species in the community and thus achieves greater reliability evaluations of the phytoindication. Austin, M. P. (2013). Vegetation and Environment: Discontinuities and Continuities. Vegetation Ecology, Second Edition. Eddy van der Maarel and Janet Franklin. John Wiley & Sons, Ltd. Published 2013 by John Wiley & Sons, Ltd.
Belgard, A. L. (1971). Stepnoe lesovedenie (Steppe Forestry). Lesnaja promyshlennost. Moscow (in Russian). Buzuk, G. N. (2017). Phytoindication with ecological scales and regression analysis: environmental index. Bulletin of Pharmacy, 2(76), 31–37. Diduh, Y. P. (2012). The principles of the bioindication. Naukova dumka – Kyiv. Diduh, Y. P., Emshanov, D.G., Schkolnikov, Y.A. (1997). The useage of the phytoindication estimations in the study of the forest ecosystem structure. 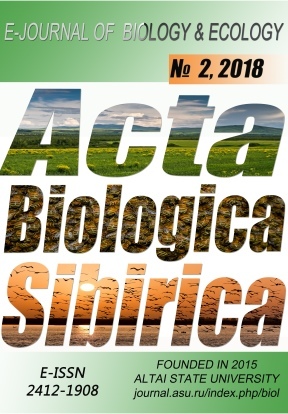 Russian Journal of Ecology, 5, 353–360. Didukh, Y. P., Karkutsiyev, G. M. (1994). Evaluation of the ecotopes humidity. Ukrainian Botanical Journal, 5, 64-75. Didukh, Ya. P. (2011). The ecological scales for the species of Ukrainian flora and their use in synphytoindication. Phytosociocentre. Kyiv. Ellenberg, H. (1974). Zeigerwerte der Gefässpflanzen Mitteleuropas. Scripta geobotanica. Göttingen, 9, 197. Emshanov, D. G. (1999). The methods of spatial ecology in the study of forest ecosystems. Ed. D. M. Grodzinsky. Mercury Globe's Ukraine. Kiev. Landolt, E. (1977). Okologische Zeigerwerts zur Schweizer Flora. Veroff. Geobot. Inst. ETH. Zurich, 64, 1–208. Manyuk, V. (2001). By spreading and typology of the middle flooded oak forest within Dnipro-Orilsky reserve and adjacent areas of the river Dnipro valley. Bulletin of Dnipropetrovsk University. Biology. Ecology, 1(9), 147–152. Manyuk, V.V. (1998). Ecological and floristic features of the Dnipro-Orelsky natural reserve oak forests. Questions of the steppe forest and forest land reclamation, 139–146. Ramenskiy, L. G., Tsatsenkin, I. A., Chizhikov, O. N., Antipin, N. A. (1956). Jekologicheskaja ocenka kormovyh ugodij po rastitel'nomu pokrovu (Ecological evaluation of the fodder lands by vegetation cover). Sel'khozgiz – Moscow (in Russian). Rysin, L.P., Comissarov, E.S., Maslov, A.A. (1988). Metodicheskie predlozhenija po sozdaniju sistemy postojannyh probnyh ploshhadej na osobo ohranjaemyh lesnyh territorijah (Methodological proposal to create a system of permanent sample plots in protected forest areas). Mscow. Progress (in Russian). Rosenzweig, M. L. (1995). Species Diversity in Space and Time. Cambridge, UK: Cambridge University Press. Seidling, W., Fischer, R. (2008). Deviances from expected Ellenberg indicator values for nitrogen are related to N throughfall deposition in forests. Ecological Indicators, 8(5), 639–646. Smirnova, O.V., Chistyakov, A.A., Popadyuk, R.V., Evstigneev, O.I., Korotkov, V.N., Mitrofanov, M.V., Ponomarenko, E.V. (1992). Populjacionnaja organizacija rastitel'nogo pokrova lesnyh territorij (na primere shirokolistvennyh lesov Evropejskoj chasti SSSR (Population organization vegetation forest areas (for example, broad-leaved forests of the European part of the USSR). Pushchino, ONTI Scientific Center of Biological Research USSR. (in Russian). Tsyganov, D.N. (1983). Fitoindikacija jekologicheskih faktorov v podzone hvojno–shirokolistvennyh lesov (Phytoindication of ecological factors in the subzone of mixed coniferous–broad–leafed forests). Moscow. Nauka.